Lake Forest, IL – (December 28, 2007) – BFG Technologies®, Inc., the leading North American and European supplier of advanced NVIDIA-based 3D graphics cards, motherboards, power supplies and other PC enthusiast products, announced today the BFG NVIDIA® GeForce® 8800 GTS OC2™ 512MB Water Cooled Edition PCI Express® 2.0 graphics card with ThermoIntelligence™ for a suggested retail price of $529.99 USD. 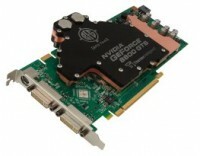 The BFG NVIDIA® GeForce® 8800 GTS OC2™ 512MB Water Cooled Edition graphics card offers exceptional thermal performance in a single slot design which frees up valuable space for other add-in cards. This water block replaces the standard double slot 8800 GTS fansink for those who currently own or are purchasing a PC water cooling system. Each card will be hand-built by a trained BFG technician with Arctic Silver® thermal compound and includes 1/2”, 3/8” and 1/4” fittings (barbs) allowing for seamless integration into most water cooling system loops. ThermoIntelligence Cooling Solution: Custom single slot ThermoIntelligence™ copper water block co-developed with Danger Den™ lowers temperatures by up to 30°C. Full Microsoft DirectX® 10 Support: World’s first DirectX 10 GPU with full Shader Model 4.0 support delivers unparalleled levels of graphics realism and film-quality effects. Built for Microsoft® Windows Vista™: NVIDIA’s fourth-generation GPU architecture built for Windows Vista gives users the best possible experience with the Windows Aero 3D graphical user interface. PCI Express 2.0 Support: Designed to run perfectly with the new PCI Express 2.0 bus architecture, offering a future-proofing bridge to tomorrow’s most bandwidth-hungry games and 3D. PCI Express 2.0 products are fully backwards compatible with existing PCI Express motherboards for the broadest support. OpenGL® 2.0 Optimizations and Support: Ensures top-notch compatibility and performance for OpenGL applications. NVIDIA nView Multi-Display Technology: Advanced technology provides the ultimate viewing flexibility and control for multiple monitors. NVIDIA ForceWare™ Unified Driver Architecture (UDA): Delivers a proven record of compatibility, reliability, and stability with the widest range of games and applications. The BFG NVIDIA GeForce 8800 GTS OC2 512MB Water Cooled Edition with ThermoIntelligence™ will be available at leading retail and etail outlets throughout North America and Europe.